State Bank of India is likely to rescue the debt-laden Jet Airways from going bankrupt, revealed sources. 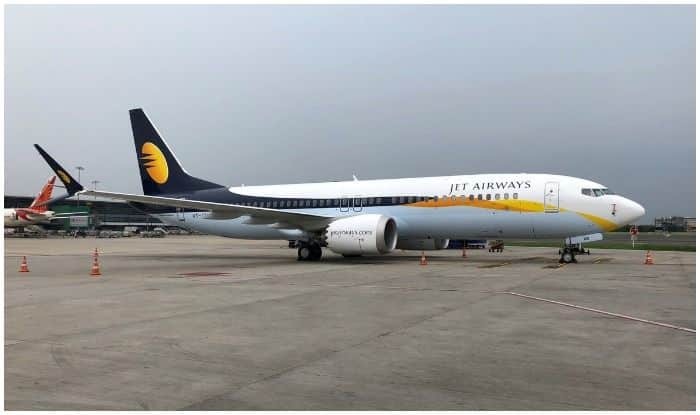 New Delhi: Debt-laden Jet Airways is currently operating a curtailed schedule with proactive adjustments made, keeping in mind the likely, yet interim non-availability of some aircraft in its fleet in the near future, said the spokesperson of the airline on Saturday. The airline has grounded seven more planes after failing to pay a debt of over $1 billion, stated a report. The airlines which also faces a threat of a strike over salary payments had earlier in the week grounded six planes. On Friday, while announcing the latest groundings, the airline said it was “making all efforts to minimise disruption to its network … and is proactively informing and re-accommodating its affected guests”. Currently, the Mumbai-based airline operates just a quarter of its fleet of 119 aircraft. According to sources, lenders led by the State Bank of India (SBI) may soon pull out the cash-strapped Jet Airways from its down-spiralling fortunes before the end of this month.